Automated Optical Inspection System Market size was valued at over USD 500 million in 2017 and will grow at a CAGR of over 12% from 2018 to 2024. The rising demand for advanced PCBs and surface mounted technology requirements in several machines & devices, such as consumer electronics and vehicles, are expected to drive the automated optical inspection system market over the future. Technically-advanced electronic machines require efficiently tested PCBs to meet the manufacturing and safety standards applied for their development. The automated optical inspection system market offers application-specific testing and fault detection at every stage of the PCB production process. 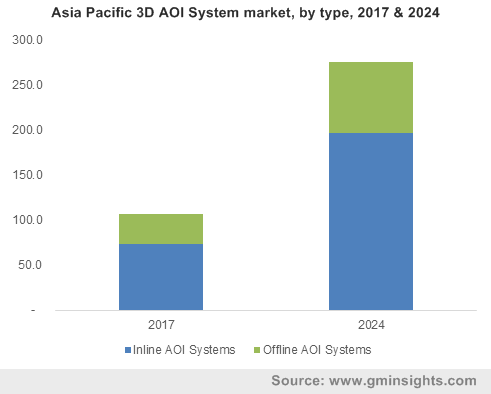 Moreover, increasing standardizations and regulations across the globe to develop safe and well-equipped machines for various industry-specific requirements are driving the AOI system market demand. The machines are increasingly deployed across the automotive and electronics industry to cater to the growing demand for reliable PCB-based components. A rise in the trend of automation in manufacturing electronic components, such as circuit boards and sensors, is contributing toward the automated optical inspection system market demand. Manufacturers are developing several PCB inspection machines that incorporate 3D inline features that offer efficient inspection as compared to the 2D options. Additionally, the increasing defects and more time consumed in manual PCB detection techniques account for the rising adoption of the market. The technical advancements, such as the use of high-resolution cameras and imaging systems, in modern inspection systems offer better fault detection results over the conventional human involved techniques. A major factor hampering the automated optical inspection system market growth is unawareness about the automated inspection machines. The presence of false call rates after deploying AOI systems is another reason hindering their demand. Maximum false call rates affect the coverage of component detection area and further hamper the production line efficiency. All AOI systems have a pre-defined number of call rates and detection area capacity. However, an increased number of call rates hinders the machine performance by providing inappropriate inspection data. These issues can be overcome by developing efficient AOI machines and incorporation technologies, such as computer-aided design and computer-aided manufacturing, to avoid the occurrence of false call rates. Imaging solutions in the AOI system market are expected to witness growth at a CAGR of over 15% owing to the essential functions performed by the cameras and sensors in the fault detection operations. The main imaging products include cameras, such as HD and machine vision, that provide better fault checking than human eyes. The key development in imaging segment is the incorporation of two to three high-resolution and high frame rate cameras into the 3D inspection systems. These imaging systems offer the detection of a larger board area and all boar parameters including height, width, and length. The suppliers in the automated optical inspection system market have developed efficient cameras and imaging systems, specifically for PCB visualization and fault detection. For instance, MEK Marantz Electronics Ltd. developed nine-camera-based AOI technology for the optimal visualization of circuit boards. The lighting products in the automated optical inspection system market are expected to grow steadily to reach over USD 250 million by 2024 due to the heavy light and brightness requirements for detecting errors on PCB systems. These products improvise the illumination of the PCB area, aiding the imaging systems to identify faults and printing issues more efficiently. The development in light sources includes implementation of LED lighting products that include color variations such as white, red, blue, and others. These sources are developed according to the PCB requirements such as low to high illumination for various applications. The lighting products enable the AOI systems to offer lighting provisioning from different angles as required by the PCB size and dimensions. These components contribute to the enhanced image quality and inspection results in an AOI system. The 3D inline systems in the automated optical inspection system market had a revenue share of over 35% in 2017 and are increasingly being deployed by the PCB manufacturers owing to the demand for highly accurate components in automotive applications. The incorporation of laser measurement technique into the 3D inspection devices accounts for their high demand as it offers better detection of co-planarity faults, which are mostly missed by the conventional 2D models. Additionally, 3D systems provide highly accurate 3D images of the PCBs, which are mainly the exact shape and volume imaging of the original device. The 3D systems offer highly defined imaging results that eliminate the involvement of human checking for detecting faults and facilitating PCB assembly. The 2D systems have dominated the AOI system market in recent years due to the lower prices and affordability, mainly for electronic manufacturers. These systems are deployed with ultra-resolution imaging systems, telecentric lenses, and lensing technology that illuminate the PCB areas to be inspected. The 2D systems are appropriate solutions for the inspection of two-dimensional circuit boards and they facilitate manufacturers with low capital funding in PCB manufacturing. The deployment of these systems aids companies to save the manufacturing costs as it eliminates human involvement in PCB detection and assembly. Automated optical inspection system market growth is primarily driven by wave soldering applications, which accounted for around 30% of the 2017 revenue due to the implementation in cases of large production volumes. The manufacturers have developed specialized pre and post-wave soldering AOI systems for the operations that are performed by liquid dissolution methods. For instance, Kurtz Ersa developed its ETS compact wave soldering machines for small & medium-sized PCB series. These machines have some limitations that include high consumption of solder, electricity, and nitrogen. 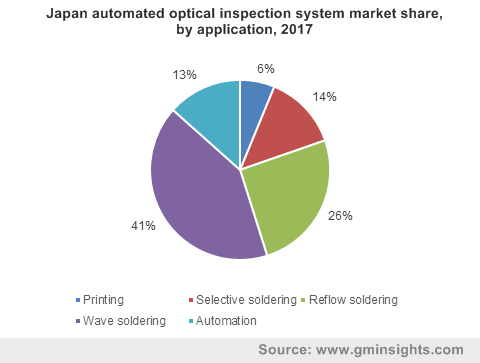 In the automated optical inspection system market, selective soldering applications are gaining a substantial popularity owing to the benefits including low operational costs over the traditional wave soldering alternatives. These techniques are used to inspect the soldering parts on partly and dully assembled PCBs. These selective soldering machines provide soldering process optimization, reliable solder joint detection, and avoid component overheating. The penetration of the AOI system market into the aerospace & defense industry is rapidly growing due to the high machinery and device quality requirements used in aerospace engineering. The material faults and weakness lead to destructive results for the manufacturers and customers as they may cause system failures. To avoid these consequences, aircraft manufacturers need to deploy efficiently inspected components and PCBs. The AOI systems are used in aircraft manufacturing for reliable component testing and supporting the non-destructive development process. For instance, Nordson developed a range of YESTECH AOI systems that meet the highly accurate aerospace industry demand. In the automated optical inspection system market, the automotive segment is expected to dominate owing to the increasing PCB requirements in automobile systems such as lighting, driving assistance, and infotainment. The automotive PCB manufacturers mainly deploy advanced 3D inspection systems due to the accuracy requirements in vehicular safety systems. Several AOI manufacturers have developed automotive application-specific AOI systems that facilitate the exact needs in automobiles. 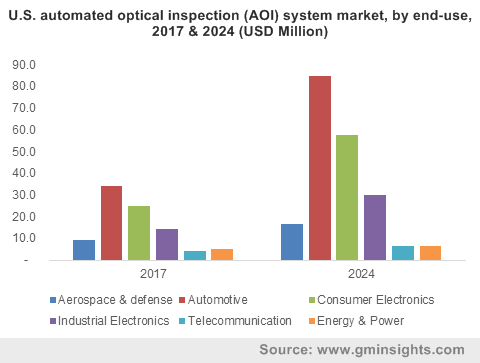 The Asia Pacific automated optical inspection system market is expected to witness rapid growth owing to the penetration of several electronic component and device manufacturing companies in China, South Korea, and Japan. The increasing awareness to develop technically advanced and reliable products to support the export business initiatives in these countries is developing the AOI system market growth. The presence of a large number of automobile producers in China is also responsible for the increased consumption of these machines. The U.S. automated optical inspection system market covers a significant share due to the early technical advancements across all manufacturing sectors in the company. Moreover, the presence of various safety and compulsory inspection standards for machinery production in the country accounts for the industry growth. The consumption of automotive and electronic products is more in the U.S. as compared to other regions due to high disposable income of the consumers. 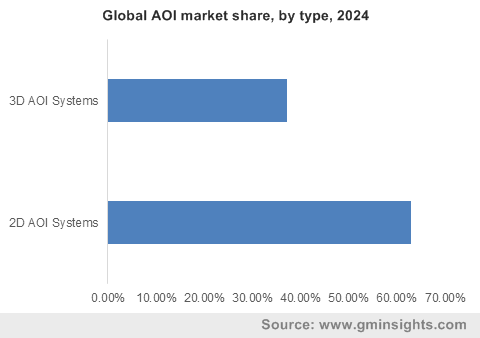 These factors are further responsible for the increasing demand for AOI system market. 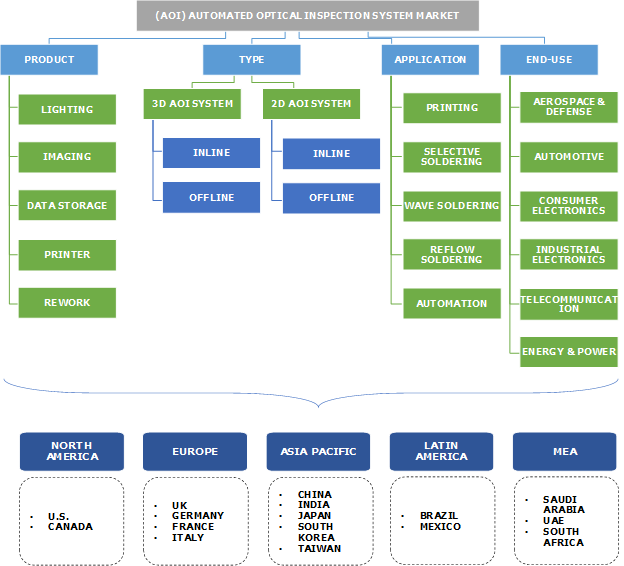 The key players operating in the automated optical inspection system market include Cyberoptics Corporation, Nordson Corporation, Kurtz Ersa, AOI Systems, Orbotech Manncorp, Mirtec, Koh Young Technology, Viscom AG, ASC International, Machine Vision Products, Inc., MEK Marantz Electronics Ltd., Saki Corporation, Chroma Ate, Inc., and Omron Corporation. The companies are developing technically-advanced 3D inspection systems that are deployed majorly in the aerospace, automotive, and electronics manufacturing applications. The major players are also developing their dealer and distribution in countries including South Korea and China, which have a high demand for these products. Industry players focus on providing legally compliant machines that support the efficient inspection of components to be used in highly accurate vehicle and aircraft applications. Technical advancements and increasing awareness related to the reliable, tested, and accurate electronic component development will drive the AOI system market growth. The industry comprises few players manufacturing the 3D, inline, and application-specific AOI systems. These players focus on offering high-quality inspection machines that eliminate the issues in error detection and limit the human intervention in PCB production. They also incorporate high-resolution cameras to provide better imaging capabilities than the conventional systems. Manufacturers focus on providing many added inspection benefits at reasonable costs to the smaller PCB manufacturers that have limited capital investments. Companies in the automated optical inspection system market aid the PCB manufacturers in saving the operational and PCB production costs by offering machines that perform detection operations at every component production and assembly.